News Corp is running the campaign across its print and digital mastheads, with a homepage takeover on news.com.au. 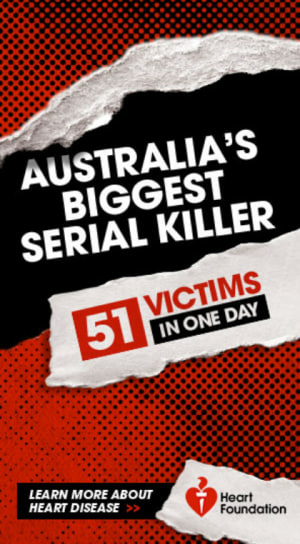 There is also a sponsorship of the True Crime Australia site, supported by TV and radio ads, as well as editorial and educational videos about heart disease on News Corp and Heart Foundation platforms. The videos explain the warning signs of a heart attack, with a focus on women as nearly three times as many women die from heart disease as breast cancer. News Corp COO publishing Damian Eales said it’s boosting awareness of the important work of the Heart Foundation and placing heart disease and heart health back at the top of the national health agenda. “News Corp has the trusted media brands, creative minds and the passion to engage millions of Australians with this important issue and kick-start a national conversation about heart health,” Eales said. It’s the first time News Corp partners with the Heart Foundation, with the work being developed since last September. The work is also supported by a social media campaign, with the hashtag #ShowSomeTicker, to drive people to Heart Foundation’s newly launched Heart Age Calculator. The push comes as Australia prepares for an election expected in May, with the budget to be delivered in April. Former Visa and MasterCard marketer and ex-head of marketing for Woolworths' digital and e-commerce team, WooliesX, Taylor, joined The National Heart Foundation last year. The Heart Foundation and News Corp have teamed up in a campaign urging the government to take action against Australia’s number one killer – heart disease. Created by News Corp’s media and marketing division Newsamp, and creative agency Host/Havas Australia, the ‘Serial Killer’ campaign taps into the current popularity of true crime stories by highlighting that heart disease kills 51 people per day. In the lead up to its launch today, the work has been teased across News Corp’s publications, including its Sunday metro newspapers and True Crime Australia site, telling Australian’s to stay tuned for the reveal of Australia’s number one killer. Heart Foundation CMO Chris Taylor said the push is not only bold, but purposeful and brave, as it asks the government to make heart health checks Medicare-funded. “If a serial killer was indiscriminately taking 51 lives across Australia each day, we’d spare no resources to bring them to justice and keep our community safe,” Taylor said. “Yet most Australians don’t know the risk factors for heart disease, including their own personal risk, or the warning signs of a heart attack. We have become dangerously complacent about it. The four-week campaign rolls out across print, digital and broadcast and includes prominent Australians sharing how heart disease has touched their lives, such as retired NSW Police assistant commissioner Clive Small and The Sunday Telegraph editor Mick Carroll.